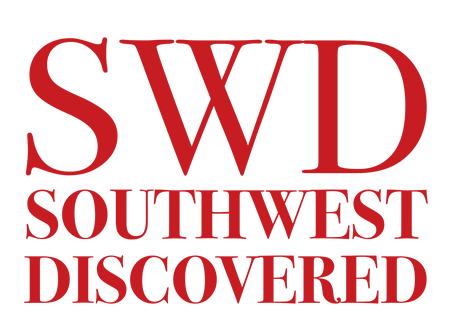 We’re beginning to see a pattern here that you may have picked up on … while Amy is planning and researching where to dine and which galleries / museums to explore, Mr.D is geared up for adventure hikes. So while Amy fell in love with Flagstaff and met gallery and restaurant owners, Mr.D drove an hour south of Flagstaff to one of the nation’s first national monuments, Montezuma Castle in Arizona, an impressive cliff dwelling dating from 1100 and 1425 AD and used by the Sinagua people, a pre-Columbian culture of indigenous peoples of the southwestern United States. A nice warm day with crystal blue Arizona skies. Access to the dwelling is down a paved pathway, a short easy walk that takes you to the base where you look up to the castle ruins. The self guided tour is a good way to go because you can spend as much time as you want. You can take a lunch and picnic under the trees, or be in and out of the park in under and hour. Now some may say that it’s not as impressive as some of the other bigger and well known cliff dwellings in the Southwest, but we say it is stunning – perched about 90 feet up a sheer limestone cliff in a natural alcove. It’s a peaceful setting, being adjacent to Beaver Creek. When Mr.D was there a Native American was playing flute music – magical. 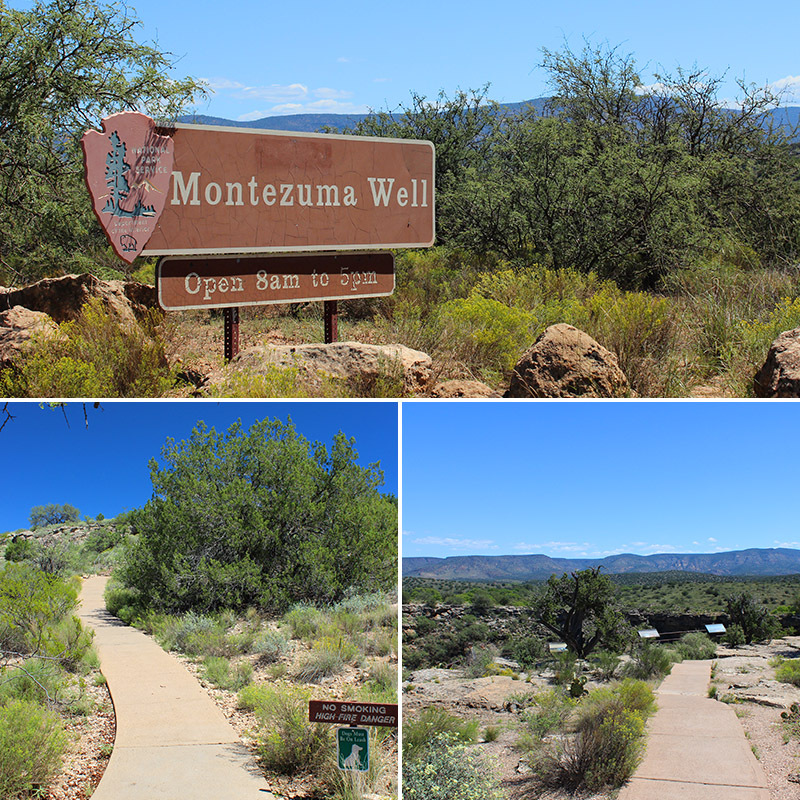 Back to the parking lot and onto I-17 roughly a 20 minute drive is Montezuma Well. 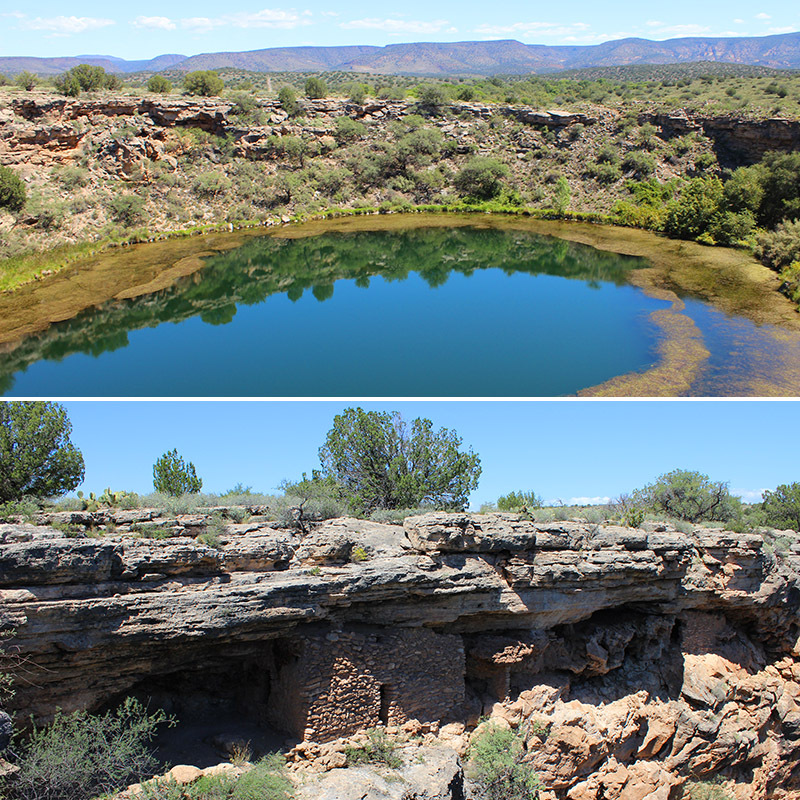 The legacy of the Sinagua culture continues at the Well. 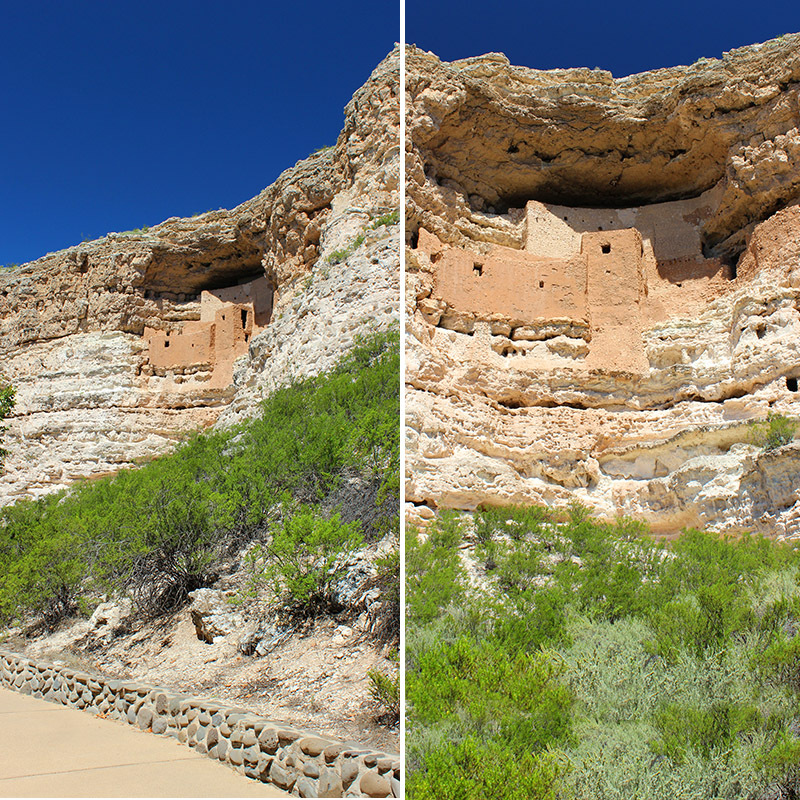 From cliff dwellings from the 1100s perched along the rim, to large pueblo ruins and an ancient pit house, the variety of these archeological sites offers much more to experience. The entrance is free, and the looped pathway to the Well is paved — mind some steep pathways and stairs. 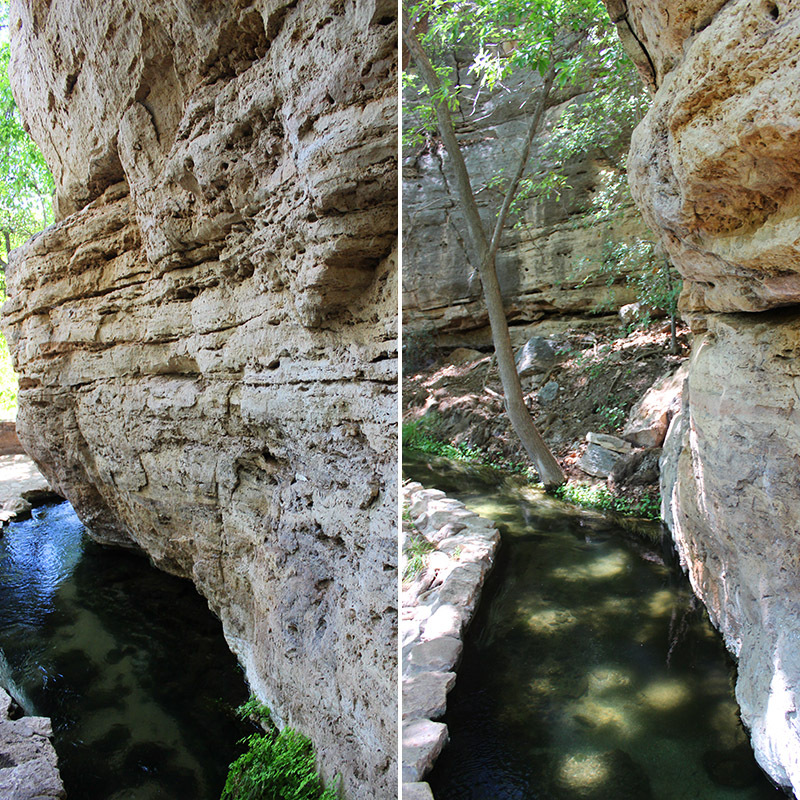 The Well is a natural limestone sinkhole with with over 1.5 million gallons of water emerging each day from an underground spring and is about 124 feet deep at the base. 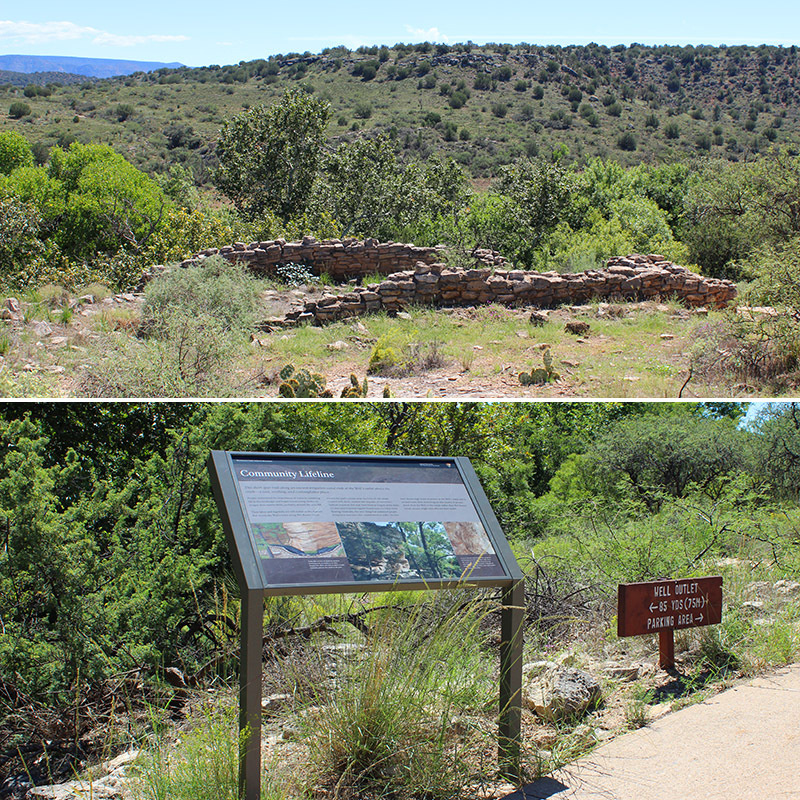 Walk up to the overlook and you’ll see ruins of several dwellings scattered in and around the rim of the Well. Follow the path around the Well, and take steep steps down to the water’s edge. There are ruins and a cave where bats have taken roost, with a helpful ranger to answer questions. Now about the trees. The ranger mentioned that to him they were the grandest part of the park that people miss – the sycamore trees. 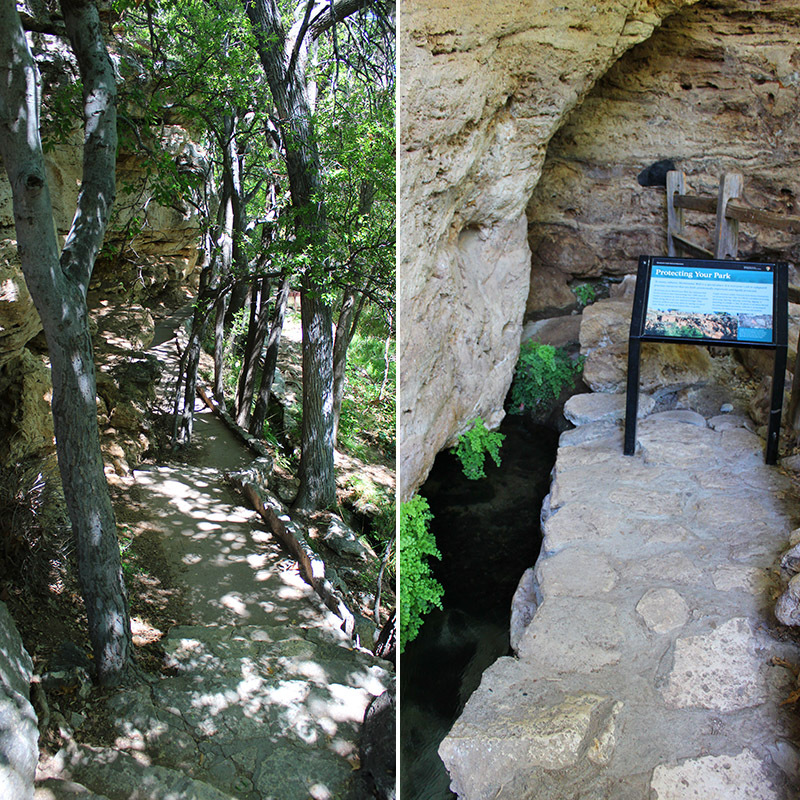 Climb up from the Well, continue the loop trail, past some Pueblo ruins, where you again go down some steps to where the spring is clear and cool and follows a prehistoric canal made from limestone rocks, and portions of the canal’s original route are still in use today with sections dating back over 1,000 years. 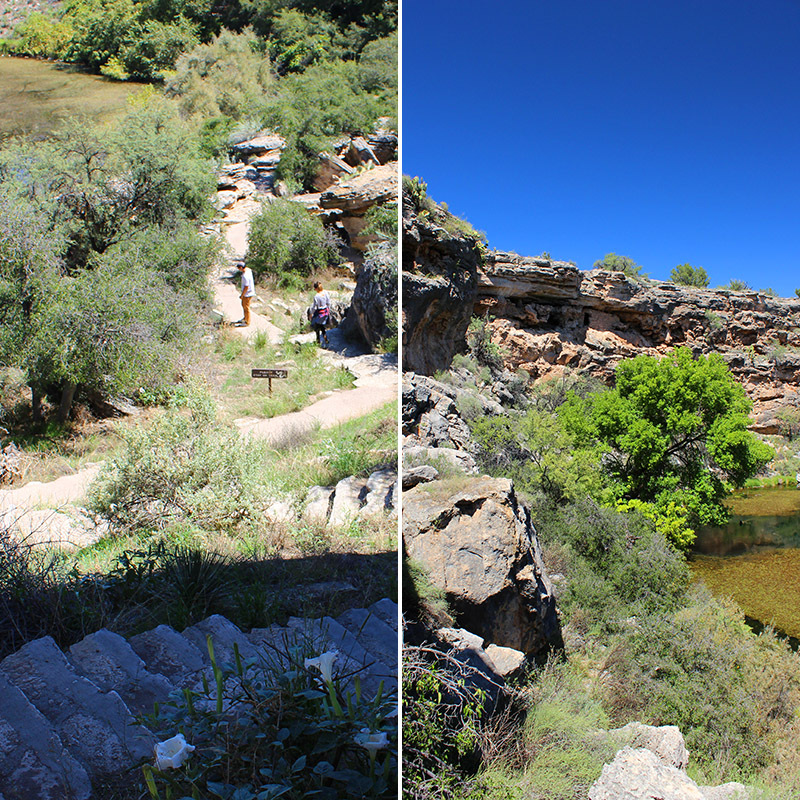 The trail to the outlet at Montezuma Well brings you to a site of pleasant tranquility, shady and cool, with the bubbling and splashing stream along the path. 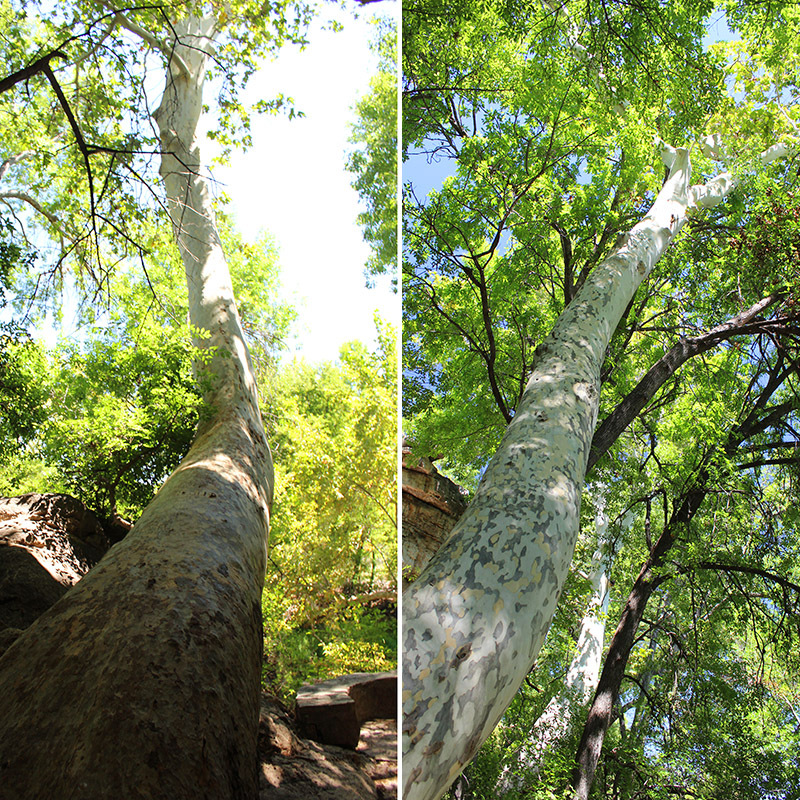 Here you will find a very old and bent sycamore tree reaching 120 feet tall and is one of Arizona’s most giant sycamore. Amazing and serene, beautiful and quiet, something that should not be missed. 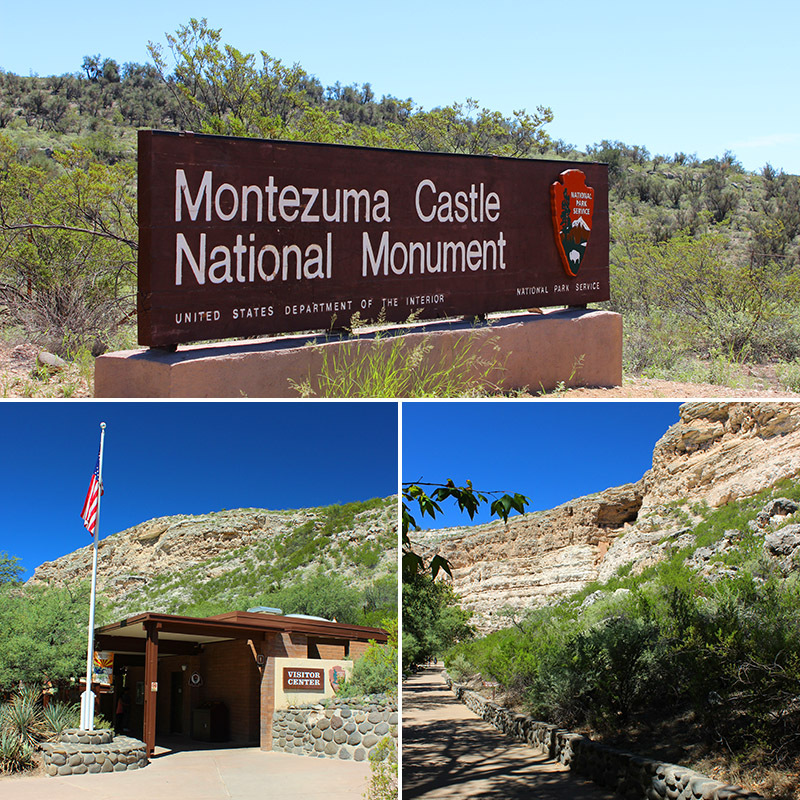 When you’re zipping along the highway between Phoenix and Flagstaff and see signs for Montezuma’s Castle, stop in to see one of the most beautifully preserved and easily accessible cliff dwellings. Then take the short drive to the Well – a more strenuous hike than the castle ruins, and oh so impressive. *Side note taken from Wikipedia: Neither part of the monument’s name is correct. When European-Americans first observed the ruins in the 1860s, by then long-abandoned, they named them for the famous Aztec emperor Montezuma in the mistaken belief that he had been connected to their construction. In fact, the dwelling was abandoned more than 40 years before Montezuma was born, and was not a “castle” in the traditional sense, but instead functioned more like a “prehistoric high rise apartment complex”. 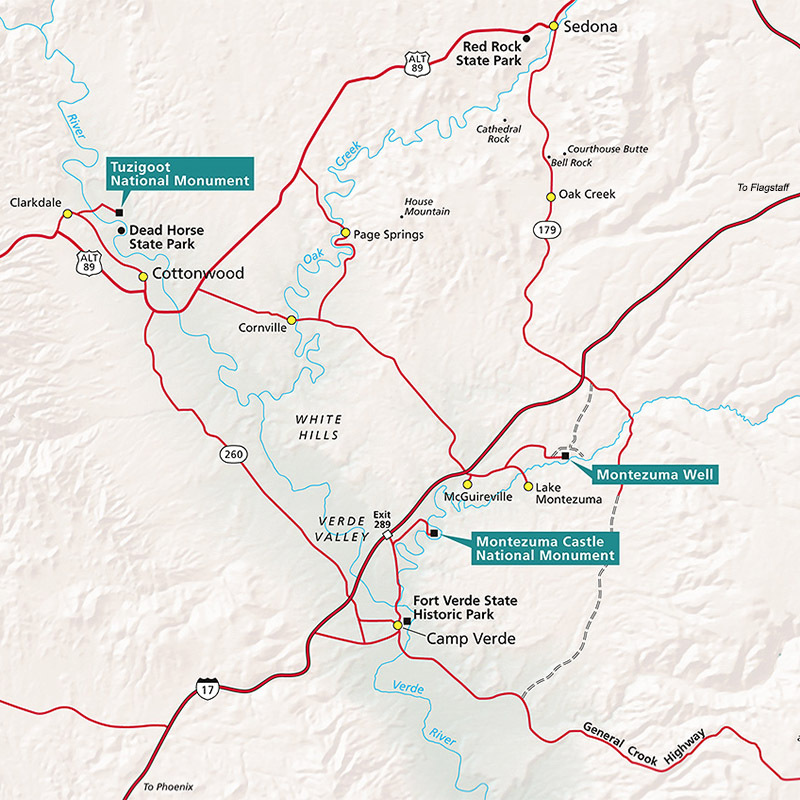 Bandelier, Walnut Canyon, Hovenweep and more. Peabody, thank you and look for more video … we’re filming most all new discoveries these days. I always enjoy Mr.D’s hikes and love the video he is filming. And hiking to the sounds of a real flute playing is magical. What a great place to stop as we drive to Flagstaff and onto the Grand Canyon. Thank you for the details and photos! ChileSage, Mr.D says it’s a fun and quick stop off the interstate. Full history and beautiful scenery. When you go please send pics and we’ll share them with everyone! Mr.D we love your articles on hikes and your sense of adventure. You and Amy must have many many things to talk about at the end of any given day. Sarah, more hikes to come so stay tuned. And yes, Amy and I always seem to have stories to tell and look forward to evenings when we can share what we’ve discovered together or from our individual explorations.